Artist’s impression of the quantum photonic chip, showing the waveguide circuit (in white), and the voltage-controlled phase shifters (metal contacts on the surface). Photon pairs become entangled as they pass through the circuit. The fundamental resource that drives a quantum computer is entanglementthe connection between two distant particles which Einstein famously called 'spooky action at a distance'. The Bristol researchers have, for the first time, shown that this remarkable phenomenon can be generated, manipulated and measured entirely on a tiny silica chip. They have also used the same chip to measure mixturean often unwanted effect from the environment, but a phenomenon which can now be controlled and used to characterize quantum circuits, as well as being of fundamental interest to physicists. "In order to build a quantum computer, we not only need to be able to control complex phenomena such as entanglement and mixture, but we need to be able to do this on a chip, so that we can scalably and practically duplicate many such miniature circuitsin much the same way as the modern computers we have today," says Professor Jeremy O'Brien, Director of the Centre for Quantum Photonics. "Our device enables this and we believe it is a major step forward towards optical quantum computing." 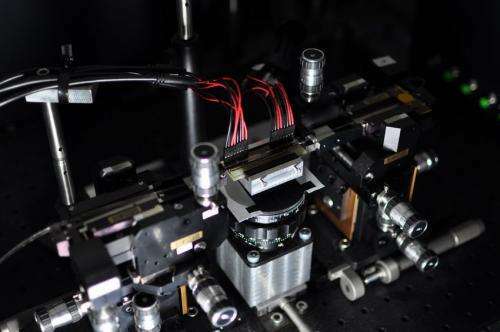 The chip, which performs several experiments that would each ordinarily be carried out on an optical bench the size of a large dining table, is 70 mm by 3 mm. It consists of a network of tiny channels which guide, manipulate and interact single photonsparticles of light. Using eight reconfigurable electrodes embedded in the circuit, photon pairs can be manipulated and entangled, producing any possible entangled state of two photons or any mixed state of one photon. The reconfigurable quantum photonic chip and two alignment stages. 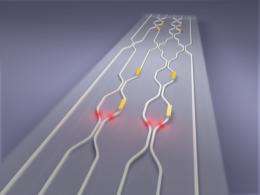 Photon pairs are coupled into the chip through optical fibres, which require precise alignment. "It isn't ideal if your quantum computer can only perform a single specific task", explains Peter Shadbolt, lead author of the study, which is published in the journal Nature Photonics. "We would prefer to have a reconfigurable device which can perform a broad variety of tasks, much like our desktop PCs todaythis reconfigurable ability is what we have now demonstrated. This device is approximately ten times more complex than previous experiments using this technology. It's exciting because we can perform many different experiments in a very straightforward way, using a single reconfigurable chip." Dr Terry Rudolph from Imperial College in London, UK, believes this work is a significant advance. He said: "Being able to generate, manipulate and measure entanglement on a chip is an awesome achievement. Not only is it a key step towards the many quantum technologies such as optical quantum computingwhich are going to revolutionize our lives, it gives us much more opportunity to explore and play with some of the very weird quantum phenomena we still struggle to wrap our minds around. They have made it so easy to dial up in seconds an experiment that used to take us months, that I'm wondering if even I can run my own experiment now!" The chip... ...is 70 mm by 3 mm. Why not create an "add-on" card to add quantum functionality to existing computers? Of course, the "precise alignment" thing could be a problem for an ordinary PC add-on card. Some quantum algorithms really only need a few qubits, so who knows. Maybe that'd be more than enough? Yes yes another quantum computing breakthrough here and another graphene breakthrough there but WHEN can i buy a laptop with a quantum or graphene processor already!!! 20 years... The government gets to control these chips for a long time, and we probably wouldn't be able to afford the start up price anyways. here comes Santa Clause . . . here comes Santa Clause . . . right down claus lain . . . doeut, dout, dout, . . .
Quantum computers are happening fast. They're going to speed up figuring out everything from nanotech to a.i. We're going to find out who's naughty or nice; i'm going to enjoy the near future! Hope you've been questioning your assumptions and following the truth! Whenever I read about quantum computing they always talk about how it's going to make breaking large encryption codes easy which honestly doesn't interest me very much. Here, it looks like they are talking about a general purpose quantum processor. What I'd like to know is how much faster a quantum processor would be in comparison to today's processors. The experiment is room temperature which is very neat, I think the major drawback is the "configurable" components rely on heat transfer which is an inherently slow process ... none the less a very neat experiment in the right direction. I can't remember the exact formula, but it is a finite improvement. Honestly, for most mundane applications it's only a few orders of magnitude improvement. For something really big, like modeling the universe, or running an A.I. or whatever, it could be millions or billions of times better with the right algorithm. Also, some problems which can theoretically be solved on a quantum computer cannot be solved on a classical computer at all, so in those cases there is no comparison. If you had an 8 digit password, the quantum algorithm could solve a worst case scenario in 16 iterations, while the best possible classical algorithm would require at least 256 iterations for a worst case scenario. This doesn't mean a QC is "16 times better". It just means a QC is 16 times better, assuming Grover's Algorithm, and in the case of N=8. If N = 2, then the QC is barely even better. If N = 100, then the QC is better by a factor of 2^50, which would be about a quadrillion times better. In reality, you will never be able to get numbers anywhere near those theoretical values, because there are practical limits. Real world applications usually have sequential data input and outputs, human interactions, interactions between different computer systems, etc. The best you can hope for is that software developers would be able to program a library of "quantum functions" which some classical functions would make use of, or pass input and output to and from one another. Highly nested algorithms like classical computers use in games, operating systems, business software, etc, will not translate easily to quantum algorithms. ALTHOUGH, you will probably be able to replace SOME functions with quantum functions, certainly not all. So you might have a quantum sort in your business software, or a quantum pathfinding algorithm for a video game ai, etc. Just dont expect Windows, or any operating system, to be a million times better. It won't be. Is it just my Trekkie self or does the artist representation looks like an Isolinear chip from the next generation.